I picked up Nicholas C. Rossis’ book of short stories after reading the latest Pearseus installment. Mr. Rossis’ storytelling style is one that drew my attention back after the latest novel and I was looking for a little more. The Power of Six (plus one) was a good collection of short stories and made for good afternoon reading. 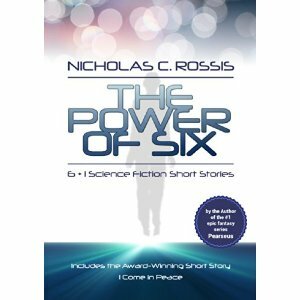 There are six stories by Nicholas Rossis and the last one is by Amos M. Carpenter. I’m just going to give a short synopsis/review of each story. Simulation Over was an interesting story for lovers of AI stories. Our characters find themselves in strange circumstances within their office building and are struggling to get out. The AI in charge of the building apparently has some leftover issues from too many disaster simulations and that’s where the fun begins. I enjoyed this story. It wasn’t what I expected from the way the story began and I liked that. For the Last Time is an interesting look at the problems of time travel. This story had some interesting points to think about and was enjoyable overall. The Hand of God was right up my alley. As an avid gamer I especially found this story entertaining. As the description of the story states this is a story exploring what happens to a game’s characters when there’s no one to play. I had not read the description of the stories when I started the book. Mr. Rossis did a good job of getting the reader into the game so to speak. I Come in Peace is an interesting story. I really enjoyed it. I liked the way the alien was incorporated into the story. For those who have read the Pearseus books the entity in this story should seem somewhat familiar. Fresh Start was a story to make you think. Our character is off traveling when some unexpected circumstances lead him to learn what is really important in life. The Sentry was really just a cute little story. It made me smile. It’s not very long and I don’t want to spoil it so I’m going to leave it at that, but was one of my favorite stories in the book. Big Bang by Amos M. Carpenter was an interesting story along the same line of those that Nicholas Rossis did in this collection. I really enjoyed reading Big Bang. It was definitely a different and witty way to look at how life in the universe may have begun. I found the story interesting and the writing style complemented Mr. Rossis’ so that the story did not seem out-of-place. As a whole this short story collection was an interesting way to while away a few hours on a sunny afternoon. Each story is designed to make you think outside of the box regarding how we perceive things, which I really enjoy and found it to be a bargain for under $1. I’m sure I’ll be reading more of Nicholas Rossis stories as I’m patiently waiting for Book 4 in the Pearseus. This was a fun read especially for those who enjoy short stories. I do and hope that you may enjoy some of these tales yourself. I’m making a special effort to clear out some of my backlog so expect more reviews soon. Happy reading. Happy to review it. I enjoy your stories. You’re welcome. Your story fit right in with the others in tone and quality.